I found the menus and such to be very intuitive and easy to remember back in the day when I used Nokias. Overall a very good user experience for a "dumb" phone from what I remember. They even produce a type that costs only 10 quid or so and a battery life of something crazy like 35 days. I'm still pondering purchasing me one of those solely for festivals, where the duration of the event tends to outlast my battery/opportunity to recharge on my smartphone. Nothing but phone calls and texting with that one though. @twelveways if you do decide to replace your windows 8 phone, I would highly recommend the Nexus 4. It is probably the best value smart phone I've used. It is cheap, it does everything a smart phone should do, wireless charging, and it runs on android. Because the phone is cheap it has had to sacrifice expensive components to keep costs down. For example, the camera (though it is good) is significantly worse than that of the Samsung s3 and HTC one x. The phone does not have 4g but does have fast 3g. As a mobile game developer I have found that our game will run at slightly faster fps on the s3 and one x compared to the nexus4, however it is not a significant difference. Overall I have been very impressed with my nexus 4 and have no desire to replace it any time soon. You could also research the Samsung s4 if you're happy spending a bit more. I have not used the Samsung s4 but going by the quality of the s3 I imagine the s4 would be very good and so is definitely worth looking in to, especially with an official Google version available. Hate to say this because I have a soft spot for Sony, but I wouldn't buy an XPeria phone again. I have the XPeria S, which I was largely satisfied with despite its niggles (has a decent camera for sure), except for Sony's software update "policy". I could live with the hugely belated OS upgrades because I bought it when ICS just came to it and it did its job. Some 12 weeks ago, they finally brought Jelly Bean, and since it is a buggy mess. There have been several bugfix upgrades since, unfortunately not in Germany, which still has that hugely flawed original JB version. I think I'll have to root the phone and re-install ICS. So no Sony again for me. From the current range of phones, I'd probably choose the Galaxy S3 Mini (not before checking reviews carefully though). Nexus seems the way to go, but I dislike the hugeness of the current one. Wish I had bought the Galaxy Nexus. Is there an equivalent to this software for Android? I'm looking for a new smartphone too, with good GPS (+Galileo?) reception. After using my Sony Erisson K800i for around 8 years now, I'm finally looking at upgrading (to Galaxy S4) and getting a new contract while I'm at it. Anyone know the best phone shops to haggle with, if not for contracts then for extras like cases and stuff? Regards shops I use mobilephonesdirect as with their cashback system contracts work out very good value, their sim free prices aren't bad either! I think it depends a bit on how long you intend to hang on to the phone. The S4 is definitely an excellent bit of kit with a great camera. I'm expecting to keep mine running long after the manufacturer is supporting it... There'll be better support for an S4 than the Z1 from the community. Is the camera as good? That's one of the main reasons I'm pining for a S4 (was considering LG G2 too though). I'll check out some reviews of it anyway, thanks. @Futaba - check out the HTC One too. It's my first android phone and I love it. I'd say nexus 5 if you can afford/import it. Other than that either Xperia Z or a galaxy s4 mini. Thanks for the tips guys, guess I'll go have a hands-on test of those to see which one suits me best. 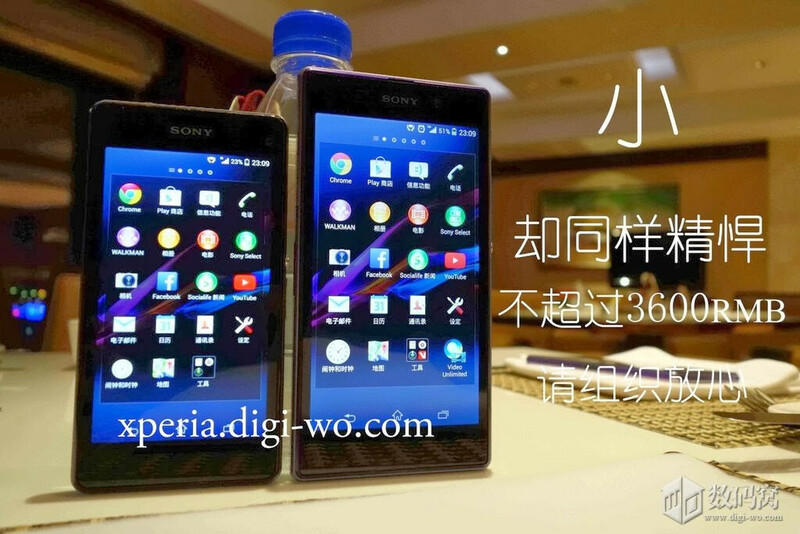 Anyone else interested in the Xperia Z1 Mini/Z1f? Still waiting for Sony to announce its international release. Were meant to announce it for the Chinese market today but instead they've put out a teaser image about something happening on the 14th of this month. Other talk is that it'll get shown off at CES next week. My HTC's battery is a joke nowadays and the earphone port has stopped working in the past week, and I'm my upgrade date is actually next week (superb timing). Am very tempted by the standard Z1 but I'm not sure about the size of the thing - it really is big and I'm very used to my 4.3 inch HTC. For those with bigger phones - do you eventually get used to it? Might demo the Z1 in an EE store at the weekend but the Z1 Mini sounds spot on (same specs, just a smaller body/screen and a lower resolution) and if it's only weeks away from release I think I might. Regarding the bigger size, don't worry, you'll get used to it immediately. I went from a Desire S to a nexus 4 with absolutely no feeling of awkwardness. On the contrary, the new phone feels a lot better in my hands. It's practically a tablet lol. I have found the Z1 looks big in shops but no so dramatic away and in the hand. Having said that I came from a S3 so wasn't much of a difference. From my old HTC 4 inch to the 4.8 of the S3 I quickly got used to the difference. I wouldn't go smaller than 5 inch now. Unless you are referring to the z1 ultra then that's ridiculous. Beast of a phone, however the camera is utterly shite. Cool. I'll give it a go. No point waiting for an unreleased handset if there's one I like already out on my network. My other option (I need a phone with microSD support) is the S4 but I'm really quite sold on the Z1, even if it'll be replaced by another flagship later on in the year. Moto g, quad core, Android KitKat 4.4, 4.5" 720p screen for as little as £99. Haven't had one in my hands so far, but by stats per price the Moto G is a no-brainer. This is a thread for paupers who cannot afford greatness. Blimey, Moto G looks great at that price point. I got a Moto G a few days back. Tis indeed a cracking phone and I highly recommend it. No Kit Kat yet, though it should come soon what with Google now owning Motorola. For the price it's unbeatable. I have just replaced my dying S2 with a moto G, 15 a month on tesco (500mins/5000txt/1gb data).. I can say if you want a phone that is fairly quick, not too big and want good battery its fantastic. As to buying flashy phones there is no point for me as I generally have my vita when I go anywhere wanting a gaming capable device although the usual mobile games seem to run no problem on them. 16gb isn't an issua as I don't use a phone as a music player as I go everywhere in the car. I was looking at the nexus 5 but it just seemed too big. Currently, Moto G and the Nexus 5 are the no-brainers if you're looking for an Android phone. They're basically equal to phones twice their price. If you get the Nexus 5 though, be sure to get the black one: the white one is a different, slippery plastic (both back and sides), while the black is very pleasent and grippy in the hand. PS. and if you read N5 reviews that complain about the camera, check the date of publication. It's been patched and is a lot more responsive now.